When retail was all brick and mortar, things were simple. Business displayed their inventory; customers came in and physically assessed it and bought what they liked. Payments, returns and exchanges were handled in the store. Was there a buying journey then? Yes. And in smaller stores, there were sales clerks to help the customer along that journey and a clerk to help with return and exchanges. The customer had experiences (now known as CX) each time he visited that store. And so long as they remained good, he returned. Online selling, however, has changed the customer journey. Because there is no face-to- face interaction, it is more important than ever to identify what that journey is and what occurs during each phase. Let’s begin with a simple definition of what is a customer journey. According to the Harvard Business Review, it is “…the steps your customer(s) go through in engaging with your company, whether it be a product, an online experience, retail experience, or a service, or any combination.”. The key term here is “engagement”. It means everything that happens from the time a customer become aware that you exist through any and all post-purchase experiences. 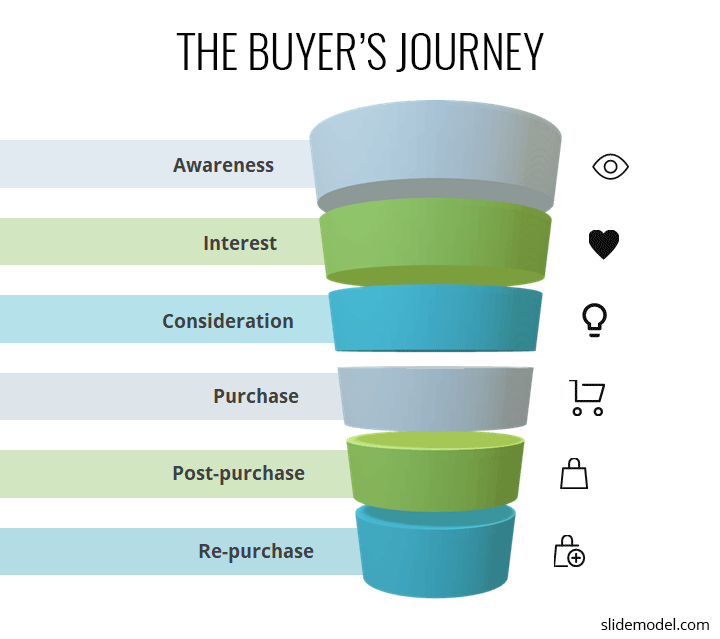 There are key stages of a buyer’s journey – awareness, interest, consideration, purchase, post-purchase, and re-purchase. Things can go well or terribly wrong at any of these stages. And this is why it is critical to create a customer journey map. With a clear map, and the right analysis, you can identify what is working well and what needs improvement. Ultimately, using the map to improve the customer journey means far better user experiences and, of course sales. 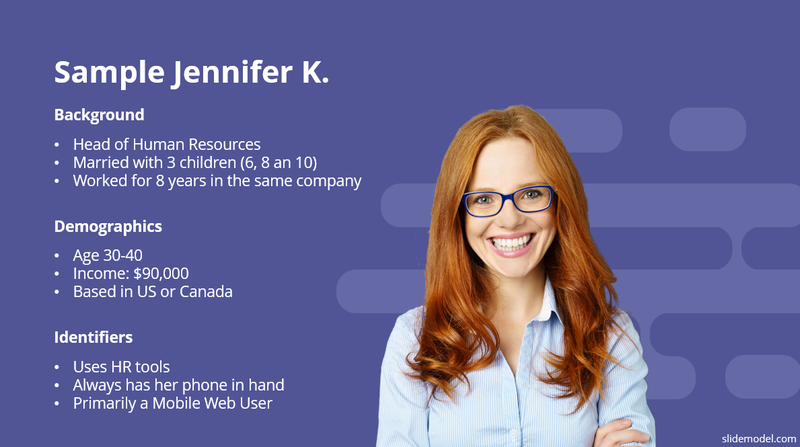 71% of companies who exceed their lead and revenue goals have documented personas. You may have developed a buyer persona quite some time ago (or not). If you have not re-visited it in a while, it is time to do so now. Having a clear detailed persona will allow you to understand what your typical customer is looking for, what he values, the pain points he has, and, perhaps most important, how he looks for what he wants or needs. If your persona is well-developed, you have an idea of what their needs and aspirations are. But to get further clarification, you may want to conduct a survey of website visitors. This can give you important information about what they are experiencing on each page and what might be missing that they want. If you have your historical sales data, you should be able to construct an average timeline for the entire journey, from first interaction through the post-sales process. Timelines are very business-specific. For example, a low-cost consumer product may have a far shorter journey timeline than that of a SaaS firm that is creating a B2B customer journey map, in which decision-making is a longer process involving several people. But, if you can get that average timeline into your map, you can then see touchpoints at which it might be shortened. These are all of the points at which a customer directly interacts with you, from initial visit and navigation through your site pages, through responding to an email, through downloading something you offer, through making queries, through purchases and after-the-sale service or feedback requests. What they did before they landed on your website – how they found you. What they do while on your website – Google Analytics will provide behavior flow charts, as well as goal flow reports that show the path of traffic through a funnel to conversion. What happens once a customer decides to make a purchase – is the experience a good one? Are you engaging in follow-up? Inbound processes are certainly great, because they give you nice warm leads. These are potential customers who have found you and have come to you without any effort on your part. What percentage of your sales have come from inbound processes? Outbound processes are those that you initiate to develop leads – ads, emails, etc. What percentage of sales are coming from these sources? This has been previously addressed, but it bears repeating. The timeline points, and the length of each should be a part of your customer journey map, because they will show where slowdowns occur. How rapidly are you handling complaints, issues, returns and exchanges? What does your feedback loop look like? How are you engaging customers to provide feedback on their experiences? These experiences obviously determine whether they return or not. Once you have gathered all of this information and data, you are ready to design a customer journey map. This may seem like a “nightmare,” given all of the information you have to work with. 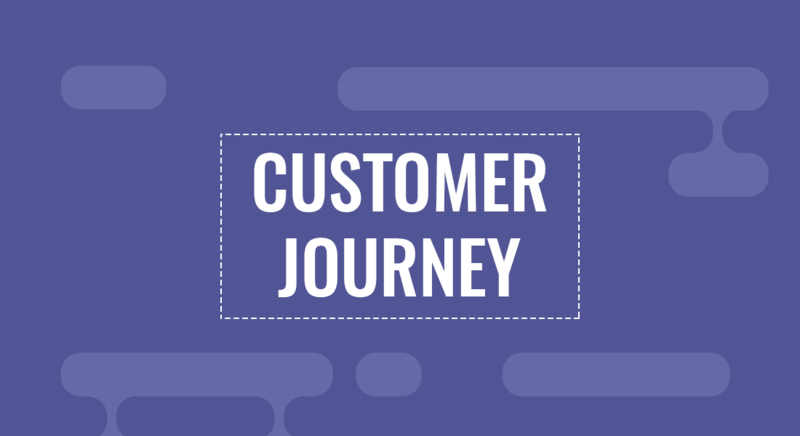 Others have gone before you, however, and have developed customer journey map templates that will at least give you a good start point. 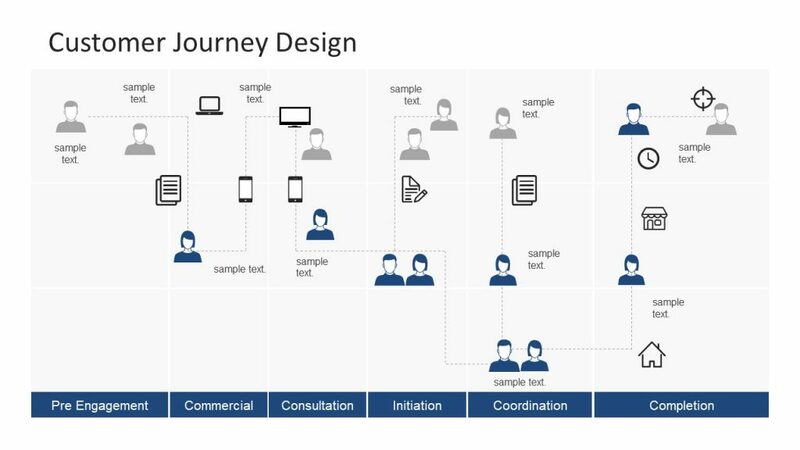 While every business customer journey map is unique, having a template to work with will certainly help. Customer experience management is a complex and ongoing task, one that involves a number of elements and functions – from development of personas, to customer journey analytics and feedback, to identifying what in that journey moves a customer forward and what stalls or slows him down. 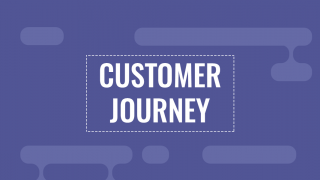 Creating a customer journey map can help an organization visualize the entire process, capitalize on what is going well and work to improve those phases that are not going so well. In the beginning, when a business may not know how to map the customer journey, it is advisable to use one or more customer experience journey map templates that others have already devised and customizing it for the uniqueness of the business goals and specific customer experiences. The one thing that a customer journey map does is provide the totality of the customer experience, so that you can ask the right questions – what are points of friction and frustration? Which pages have the highest bounce rates? Are carts being abandoned? Are post-purchase services satisfactory? These are the things that can move a company to make the right decisions that will provide a satisfactory and seamless experience. Here are some popular templates from our collection that you can download and customize up to your needs e.g. transform into a retail e-commerce customer journey map or a more general B2B Customer Journey map template. Here’s a minimalistic template to help you create a general outline for your document. You can use it to map out the key touchpoints you have with prospects at different stages of their buyer’s journey – pre-engagement, consultation, initiation, coordination, and completion. It includes three levels of touchpoints that define the persuasive activities that can occur during interactions with potential buyers. This template will make a great presentation to departments within an organization. It identifies both positive and negative customer experiences and when they occur during the customer journey. Once those negative experiences are identified (through analytics, customer feedback, etc.) they can be attacked. And the right department/team can be assigned to come up with plans for rectifying the issues. This design is simple and neat and shows the buyer’s journey in conjunction with the organization’s activity. The touchpoints are all identified on a timeline, with the goal of showing the interdependence of the customer journey experience and the company’s activity at each of those touchpoints, where they intersect. Using this template allows you to inject the unique experiences of their customers and the steps they take to ensure that the experiences are good. Data from analytics and customer feedback can be inserted in the form of text boxes. 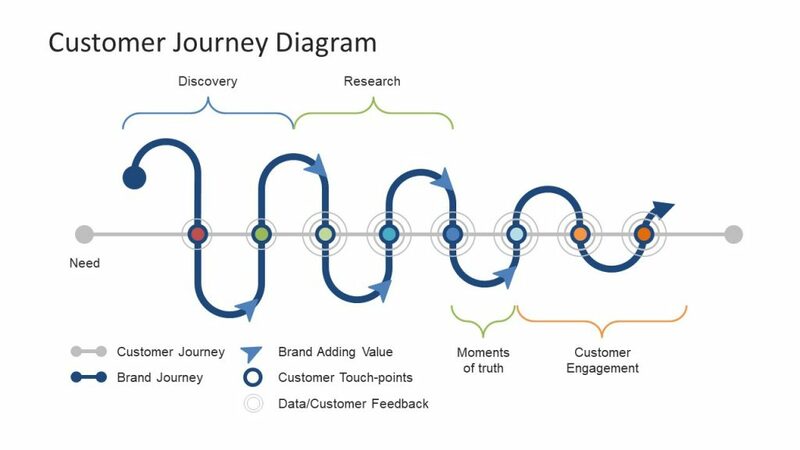 This gives a very clear picture of what is happening in a buyer’s journey and how an organization can make modifications in its activity to enhance that journey. 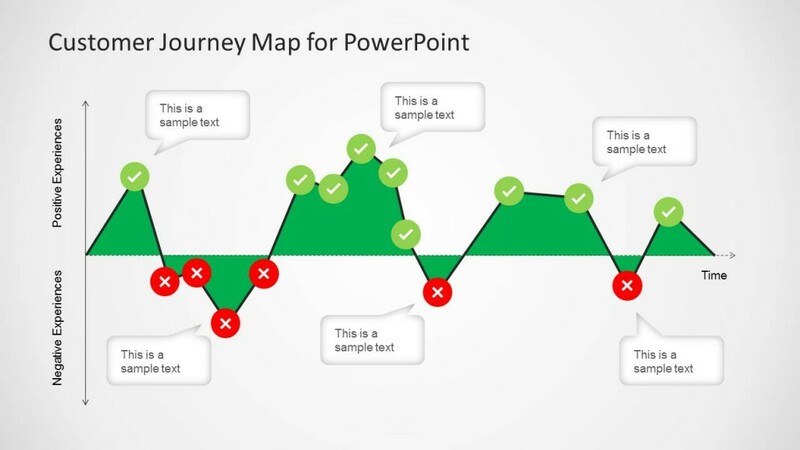 This is the first of a four-part PowerPoint presentation of a simple customer journey map. The first slide shows the customer engagement process from the identification of a need, through the research and purchasing steps and then the post-purchase steps. 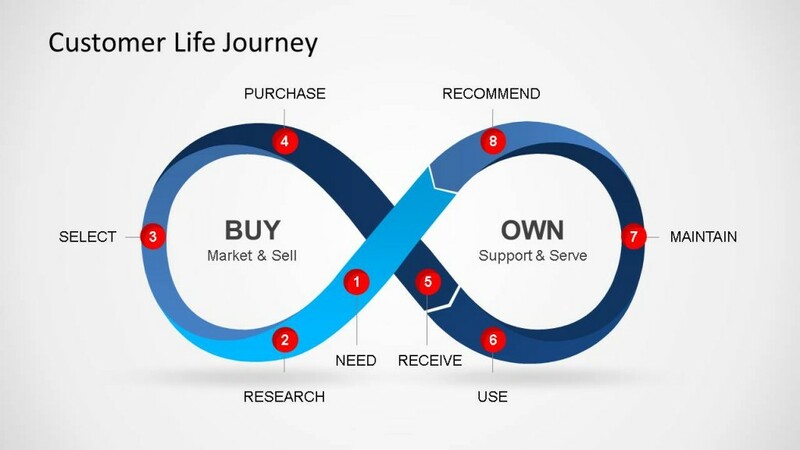 In the middle of this “infinite” loop are the steps that a company takes to support the customer journey. A company can identify what it is doing at each step in the “buy” and “own” segments, including inserting the typical persona timeline from the historical data that has been analyzed. 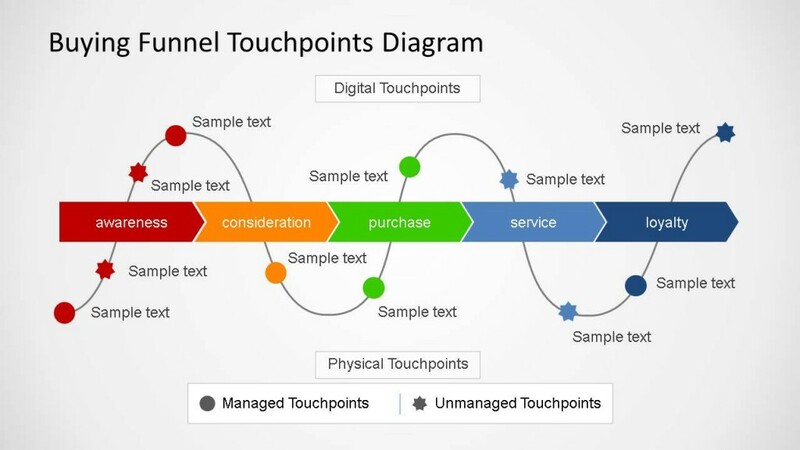 This is a great customer experience journey map template to identify all touchpoints – from awareness, consideration, purchase, and service, to loyalty. Using this template, organizations can insert all that they are doing at each touchpoint, what the analytics are showing, and then develop strategies to improve the experiences through any touchpoints that are shown to be problematic. 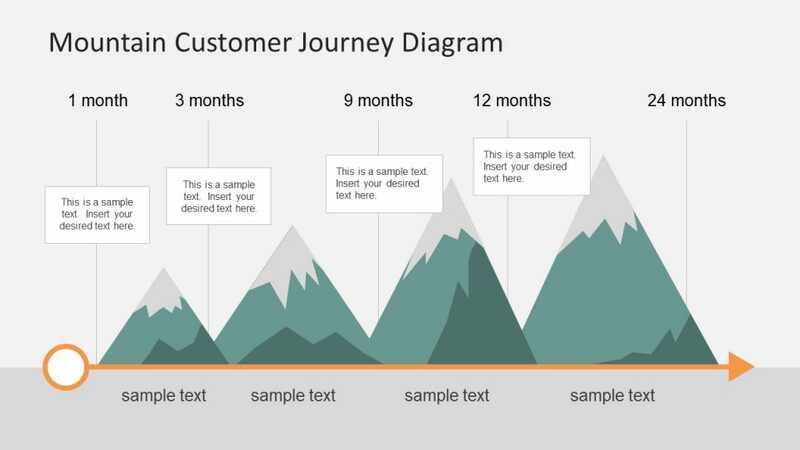 Here is a template that presents the stages of engaging the customer through a timeline that will track purchaser engagement throughout the journey. This helps to explain the customer experience from beginning to end and the steps that a company should take along the way to ensure a long-term repeat customer relationship. The goal is to educate the relevant departments/team members about customer satisfaction (or lack thereof) at certain points along the journey and can drive decisions regarding improvements in customer experiences. The peaks of the mountain represent high points in customer satisfaction; the low points represent what the analytics and customer feedback determine to be unsatisfactory. The template itself is highly customizable.